Nowadays burgers and pizzas have become common like rice/roti. Though magazines and newspapers are show cashing the good and bad things about them, the craze on them is still unfading. In fact I can say it's increasing. I am not an exception to this crazy crowd. I had take a oath not to have them but oh...occasionally I break my oath whenever I see delicious burgers in restaurants. Needless to say about burgers and more, I am jumping directly into its preparation. This time I have prepared Burgers in an Indian style with the ingredients that are commonly available at every household. They came out very well and tasted like normal veggie burgers. I have added only carrots in place of vegetables and chickpeas. You are welcome to add any vegetables of your choice. Also for serving burgers, you can add cucumber, cheese, and other ingredients which you feel might add taste and style to the burgers. Just for health concern I didn't add any cheese. Try it out, They are delicious!!! 1) Soak chickpeas over night or 5-8hours in warm water. After 8 hours, wash it well. 2) Pressure cook it by adding 2 cups of water and when it done, drain the water and grind them coarsely. Make sure it is little dry. Keep it aside. 3) Take a pan and heat oil in it. When it is hot, add ginger garlic and minced green chilli. Stir for few seconds. 4) Add onions and saute them till they are soft and transparent. 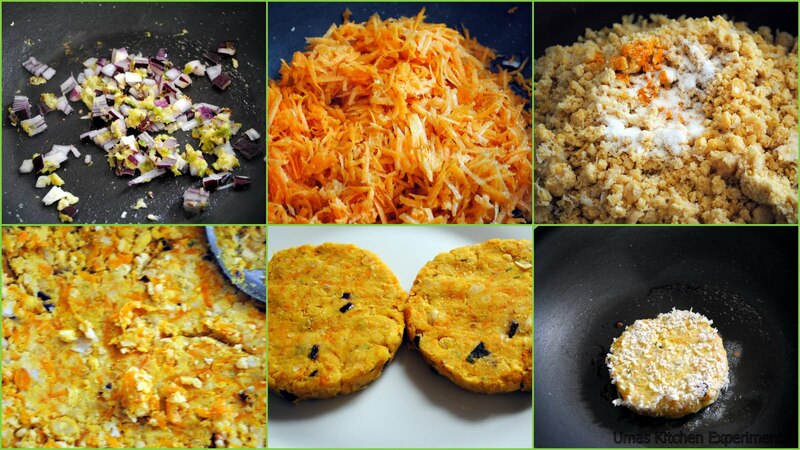 5) Add grated carrot(or any vegetable of your choice) and stir it to cook without adding water. 6) When the carrots get cooked well, add ground chickpeas. Give a quick stir. 7) Add Garam masala, turmeric powder and salt. 8) Continue stirring till it turns into a kind of dough like substance. At this stage remove it from heat and allow it to cool down. 9) Divide the dough generously into 6 balls and make patties with the thickness of 1 cm as we prepare for cutlets. Keep them aside. 10) Add little water to All Purpose flour and make a watery batter. In another wide plate take bread crumbs. 11) Dip the patty first into batter and then into bread crumbs. Place the breadcrumbs coated patty in a baking tray. 12) Repeat the step for other patties. Slightly coat the patties with oil. 13) Bake them for 30 minutes or until they turn golden brown in colour in a 250C preheated oven. 14) You can also shallow fry them in a skillet as we do for cutlets. I shallow fried 3 and baked 3 patties. 15) Once baked/shallow fried, cool them slightly so that they can be served with burgers. 1) Take burger buns and coat the inner side with pizza sauce / tomato ketchup. 2) Place the cabbage slices just beneath these buns. 3) Place a patty followed by one slice of tomato and 2 slices of onions. 4) On the top, place the other slice of the burger bun. 5) Have a big bite and enjoy. Thanks Priya for letting me know. Sending this recipe to Priya's "Fast Food, not Fat Food" which is hosted by Vardhini. Never say no to this healthy n yummy burgers...very nice pictures Uma...neatly presented...so likey !!! Perfect chickpea patties... so neatly done!! Chickpeas are making it more healthy. No one will say no to it. new but fabulous combination of burgar .super!!!!!!!!! looks awesome,as well nice presentation!! Burger looks delicious, yummy and tempting. I appreciate for your wonderful presentation. Nice idea using chickpeas in burgers.. Nice presentation and clicks.. 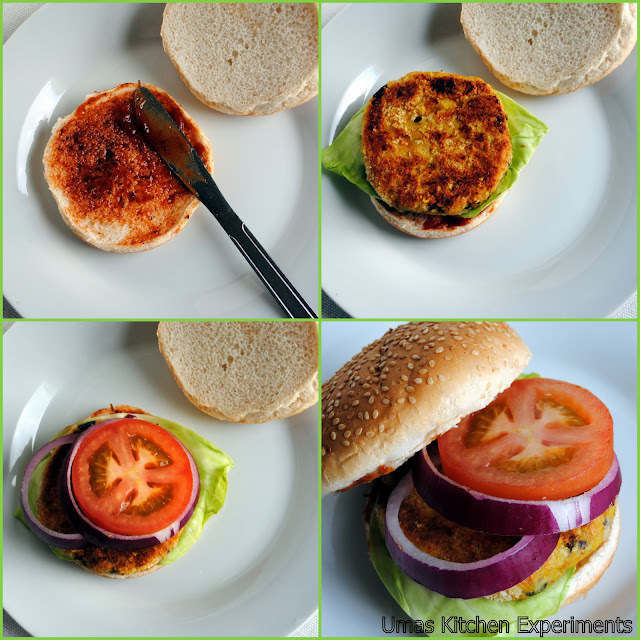 Interesting idea of using chickpeas in burger !! so healthy and loved the way u presented it !! i love the photography too dear!!! Delectable patty, burger is totally up for grabs. wowee; the patties in the burgur has me hooked- loved the Indian floavours to it, I have a mediterranean flavoured chickpea patty in my blog; anyways the burgurs look slurpilicious!!!! Delicious and healthy burger,looks so inviting. Yummy and delicious .. love chickpeas. Thx for linking to the event. mouthwatering burgers...amazing clicks Uma...lovely presentation..